Here’s a punch list for tracking down this emerging problem with this otherwise decent washer. NOTE: If the washer is installed on a pedestal, begin at Step 1. If the washer is not installed on a pedestal, start at Step 3. For more detailed information, start a new topic in the repair forum. 1. Make sure that each of the washer footings has a foot pad– see photo. I know, this seems like such a no-brainer that it’s hardly worth listing. But after running this site for 10 years, I’ve learned not to over-estimate my grasshoppers. 2. Make sure the four screws attaching the washer and pedestal together are tight. 4. Verify that all four feet are in firm contact with the floor. To do this, push and pull on the opposite corners (left rear/right front, right rear/left front) of the washer. If there is any movement front to back, you will need to adjust the feet. Adjust the appropriate front leveling foot to eliminate the movement. If the right front corner is moving, adjust the right front foot. If the left front corner is moving, adjust the left front foot. Is easy, da? 5. 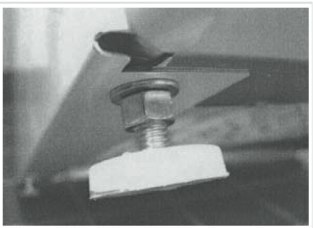 Ensure that the leveling feet locknuts are tight against the bottom of the washer or pedestal cabinet, not the footpad. See the photo. 6. Tighten the leveling foot locknuts, if necessary. 7. Run a test load consisting of 11-12 medium-size towels in the Rinse/Spin cycle and determine if the washer is a vibrating or walking. If the washer is not walking, proceed to Step 11. 8. If the washer is walking, clean the floor and leveling footpads thoroughly and be sure they are dry. 9. Repeat step 7 to confirm improvement. 10. If the washer does not walk, but there is vibration that is still unacceptable, skip to Step 12. 12. If you’re still not satisfied, replace the suspension dampers and tub springs with this kit. It comes with an instruction sheet. This entry was posted in Washer Repair on January 9, 2007 by Samurai Appliance Repair Man.